Sir Ian McKellen is a multi award-winning English actor who has awards for his work on stage as well as on the screen. Perhaps his most well known role was playing the part of Gandalf in The Lord of the Rings and The Hobbit trilogies as well as Magneto in the X-Men films. He celebrated his 80th birthday with a national solo tour in 2018/9. Tue 7th May 2019 Ian McKellenEveryman Theatre (Cheltenham)More Info..
Mon 3rd Jun 2019 Ian McKellenLyceum Theatre (Sheffield)More Info..
Sun 16th Jun 2019 Ian McKellenNew Theatre (Hull)More Info.. 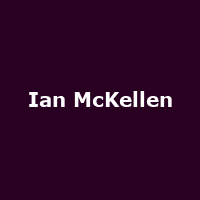 Wed 3rd Jul 2019 Ian McKellenThe Marine Theatre - Lyme Regis (Dorset)More Info..
Sun 18th Aug 2019 Ian McKellenTheatre Royal (Newcastle-upon-Tyne)More Info..